Artist’s don’t take time off, didn’t you know? So with much guilt and apprehension, I took three weeks off in January. The plan was: get to San Francisco, hang out and catch up, make some art, think art thoughts, come home full of new and inspired art plans. ‘You’ll make loads of new art connections, right?’ Um. Going to a new place is full of challenges. Being an art tourist is especially challenging. 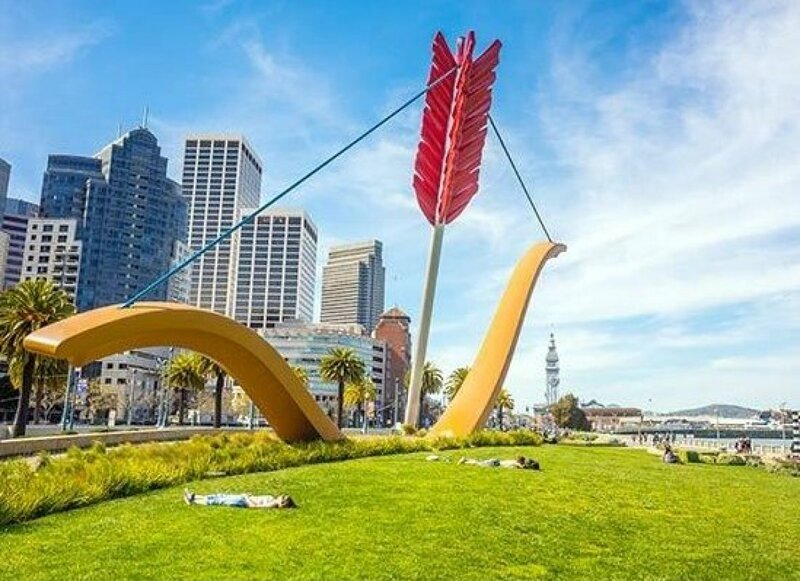 Easiest to find are the large scale art instutions (SFMoMA… thanks for being closed for refurb during my visit), and well funded public sculpture/art (check out this giant bow/Oldenberg). With a bit of looking and guidance, the small scale commercial art galleries are pretty easy to find, and the art-eccentricities – SF’s best being the not-so-accurately named International Art Museum of America (hilarious, and well worth an hour of your time, but later slightly discomfortingly weird). But what of the art that is truly ‘of’ the place? This is where my heart lies, but also in often the least looking like art, and being the least aimed at a tourist market – the hardest to find. I have to admit, to getting distracted somewhat on this mission, there were after all a lot of good things to eat, people to meet, dates to be had and wine to be shared. But where does useful art exist? Cities are also full of challenges. There are tonnes of people, space is pricey, competition is high. Opportunities are both everywhere and nowhere. (Oakland turns out to be full of those kind of emerging, experimental spaces – a brief visit to a well hidden venue, The Salt Lick to watch slideshows in the dark, made my trip feel a little more real). I could not possibly imagine being an artist here. What would I do all day? As with all places, cities take a little while to know. Gradually, artists and musicians and creative types appeared from all corners, working day jobs as many of my city friends here, by night hoping to create worlds of their own. But I hear that artists are moving out of the city. It’s too expensive, and the creative edges are moving to elsewhere. This red bike changed my visit entirely. But too, here is a city where creativity as it turns out, is embedded in the everyday. Retail is a happening thing, businesses are bustling, the economy still seems on the up (fueled by the still running tech industry) and the arts feed on the gaps within these. Bakeries and florists are filled with entrepreneurial and talented creative types, stretching traditional business models in new directions. Designers and makers are moving in with the retailers, creating hybrid-shops that are both making studios and retail spaces. The energy starts to feel more vibrant. These are places full of hard-working people, though it can be difficult to tell if those hard-working types are also achieveing their dreams, or just running within the city’s systems. But how beautiful a city! And how kind and positive and intelligent and interesting are so many of the people! It’s definitely an attractive thing. San Francisco still has a lot going for it. (Superbowl, rocketing rents, homeless problems and that big old gentricification cloud holding it back). So I was still working on not working. Only problem is, working on not working is inherently not quite resting either. Attempting cross-continental working wasn’t quite panning out either. Artist’s can quite help but look. We are joining dots, noticing how many beautiful ideas there are in the world and how best to join them together with string (thank you, friend). The narrative of the city, playing into my non-working-working brain. Three weeks later I arrived less the jet-lag (SUCCESS) in Glasgow, albiet majorly-sleep deprived. I also arrived thoroughly less any new artwork, less new art connections and less any residencies or future projects on the beautiful West Coast of the far away. This, conveniently, turns out not to be a complete failure. As, a) a self-employed human being, and b) a highly locally focused one, the issue with spending too long in Dumfries is simply that. Artists are still, for some reason, not supposed to take time off, but without time off – time to reset creative processes, work cycles and sleep patterns, without new visions, fresh eyes and a change of (weirldy accented) voices, how can we hope to keep changing the world? Post -trip, I still have a lot of questions. In a world without the sort of arts funding or support we have here, it seems any wonder that the arts survives in the hard-rushing cities of America at all. How do you get into arts circles in big cities? (Or little cities, come to that – if Dumfries gets to having city status, do we get to have an art scene…?) What does it mean to be an emerging artist anywhere? Special-est of thanks to my personal tour guide, entertainer, organiser etc etc for the wonderful adventure.